Shown protecting this artillery position are all three articles: gabions, fascines and bales of wool. One could have found any two used together but it was probably rare to have found all three together. Click here to see what is what, and doubleclick that link to return to this image. Protection for infantry and artillery was handily provided with gabions, fascines and bales of wool. Portable, these were made and deployed in little time wherever the enemy placed his fire. These supplemented fixed defenses, say, a row of gabions atop a parapet or in front of the covered way. They were also thrown up to create temporary works. Although included in this portion of the Web site, these items were as much used (and often more so) by the attackers to shield their trenches as they dug toward the fort. Basically, the three functioned to absorb small arms fire, canister shot, and perhaps the small-bore cannonball that was mostly spent in its trajectory. But something like a 24-pounder could have turned a gabion into a shower of dirt and broken rock. 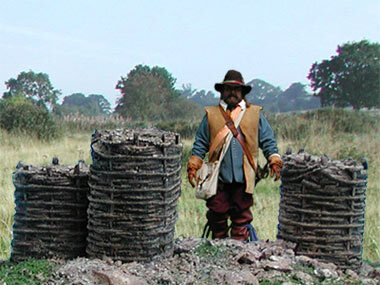 Gabions were woven in various sizes. Usually, they were open at both ends, and the vertical rods extended a several inches from one of the ends and were sharpened to anchor in the ground. Set on that end, the "basket" was filled with dirt and rocks, which could have been right out of the trench being constructed. Once filled, they became immobile but were sturdy, affording protection - as long as one did not stand in any gap between two. For that contingency, gabions were occasionally arranged in two closely spaced rows, alternating with one another. They were also stacked one atop another, if the basket makers were producing short ones. No period illustration shows, however, more than two tiers of gabions. The modern-day replacement is the sandbag. Instead of a second tier of gabions, sticks and wood tied together in bundles could be laid atop gabions. These were fascines and could be made quickly by any soldier, unlike gabions that were woven by those with basketmaking skills. A portability drawback to gabions was they became immobile once filled (unless unfilled), whereas fascines could be picked up to be moved to another site. Of course, fascines were also used by themselves, sometimes stacked several deep or even racked on their ends. Fascines typically were one to two meters long, but some, called saucissions or sausages, were as long as five meters, used atop parapets. Wool bales at first seem a curious sort of shield. Thinking beyond Little Bo Peep and cuddly lambs, a fat bundle of wool densely packed would absorb a musket ball as well as a gabion. Furthermore, in some areas wool bales could have been easily had. Wool production, especially in the 17th century, was an expanding industry and wool actively traded. Some towns could have had sheds and warehouses stacked with bales. One wonders, though, about the market value of any wool bale after it was shot up in a siege.